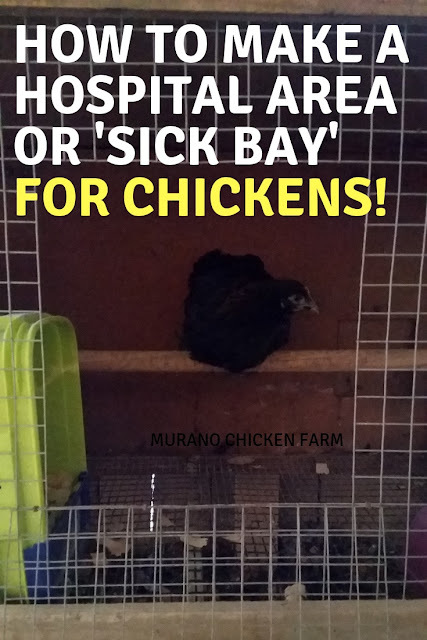 Before you determine how you want to set up your hospital cage you need to determine exactly what is wrong with the chicken. If she has a wound, a broken bone or some other sort of injury she can be placed inside the coop in a small cage if your coop is big enough. This way she is kept separate but at the same time she is near her flock mates. A hospital cage or sickbay can be as small as a dog cage or crate in the corner of the coop or it can be a room in the house that isn't being used. The hospital area needs some kind of bedding or lining that can be changed often. I use regular bedding in the coop but often use puppy pee pads or towels in the house. I always consider what is wrong with the chicken when choosing which bedding I'll use. If the hen has an illness where I'm going to need to evaluate her poop, then puppy pads work better than traditional coop bedding. An open wound might also call for towels or puppy pads since wood chips or small pieces of straw can stick to a wound and hamper it's healing. Otherwise, I'll just use whatever bedding is normally used in her coop. You'll need to have enough space for her food and water and the whole thing needs to be in a draft free location...but that's pretty much it. Nothing fancy is necessary, in fact the simpler the better. If you are using space inside your house, you'll still want to use a crate or block off a small area for the chicken to use temporarily. Too much exploring or activity is not always good when healing from an injury. Related reading: What is in your chicken first aid kit? Free printable checklist! If the ill chicken is contagious you want to care for her absolutely last when you do each round of chores. Make sure the full flock is fed and watered and cared for before attending to the sick chicken and then immediately wash your hands and sanitize them. Be very careful not to cross the germs back to the regular flock or you'll end up in a vicious cycle of caring for one sick chicken after another. If she is not contagious though, a small pen near the coop can be a perfect way to keep an injured chicken separated but close by. I sometimes use my grow out pen as a small first aid area for chickens. It's also a great place to seperate some of the chickens if they're pecking each other or fighting. 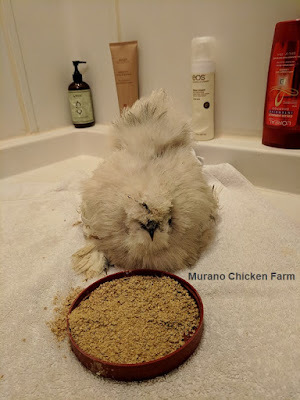 A few months back we talked about how rarely chickens get sick which means that there is a good chance you won't need this information any time soon...which is definitely good news!